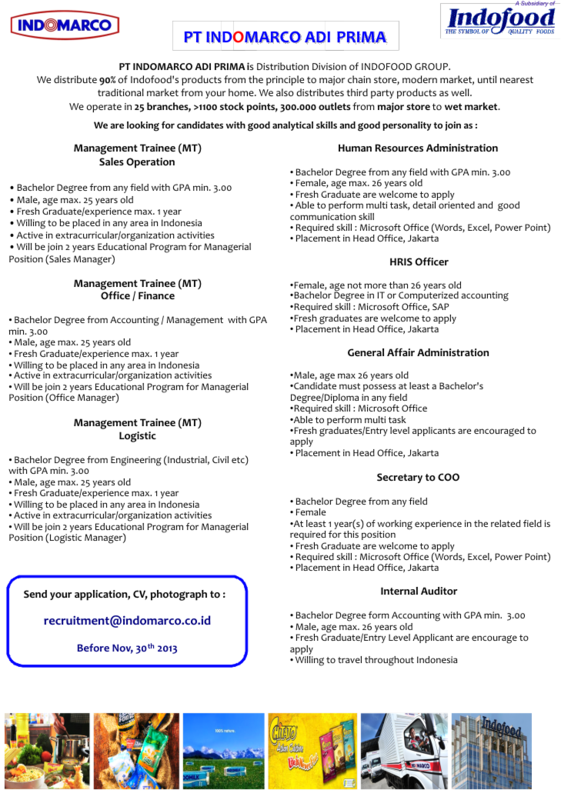 Lowongan Kerja Terbaru PT Indomarco Adi Prima – IAP or known as Indomarco is a distribution division of PT Indofood Sukses Makmur Tbk, a leading food manufacturers in Indonesia. PT Indomarco Adi Prima distribute 90% of Indofood’s products to more than 300.000 outlets in all over Indonesia, including major chain store, modern market, and traditional markets. The Company’s corporate office is based in Jl Jend Sudirman Kav 76 – 78 Jakarta. At present, Indomarco has 25 branch offices, and also supported by approximately 1,500 stock points in most of major city in Indonesia. [email protected] before 30 November 2013.